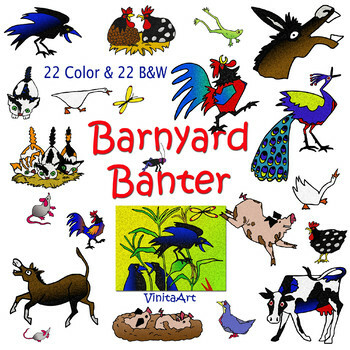 Barnyard Banter set of 23 color and 23 black and white. Each image is high resolution 250 dpi. 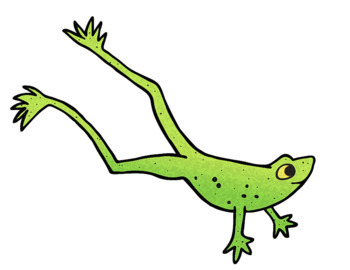 All images are in the PNG with transparent background. format except for the full coloring page which is JPEG. 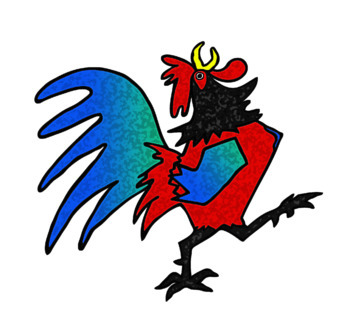 This set includes: 1 coloring page of crows in the field, 1 of the butterfly, 2 images of goose, 1 single of a crow, 2 of a donkey, 2 of mice, 1 of a cow, 1 of a cricket, 1 of a pigeon, 1 of 2 hens sitting on their nests, 1 of a single hen, 1 frog, 2 single roosters, 1 peacock, 1 pig, 1 of 2 pigs in the mud, 1 of a single kitten and one of 3 kittens together. Each animal that makes sounds in the story is represented and in a single image so it can be cut out and used as paper stick puppets if you like. These would be great to use in your curriculum, cut them out or add them to your own product to give some great visuals to your own shop. You may use these anyways you like as long as you don't resell them as clip art. Feel free to add to your own product to resell for enhancements and added fun, create coloring pages, games, etc! Please stop by my shop and check out my other story book art, Aesop's fables, Tall tales, Science, Animals and Paper bag puppets. Each week I'm creating more products so visit often and grab your freebies while you are here!